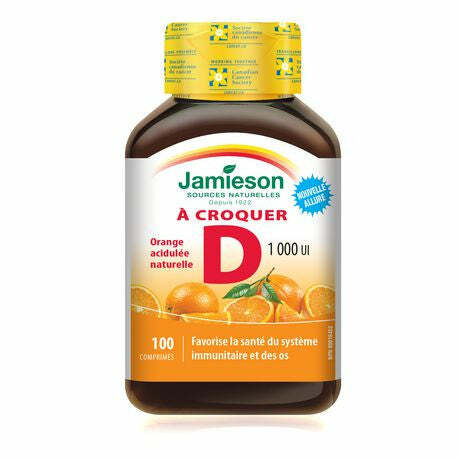 Jamieson Vitamin D chewable 1,000 IU is a delicious formula in orange flavor that helps to protect the bones and teeth as well as to improve the calcium absorption. Medicinal ingredients: Vitamin D3 (Cholecalciferol) 25 mcg / 1,000 IU. Non medicinal ingredients: Cellulose, citric acid, natural orange flavours, vegetable stearic acid, vegetable magnesium stearate, silica, dextrose, sucralose. No salt (NaCl), gluten, lactose, aspartame, artificial, colours, flavours or preservatives. Delicious chewable tablets in orange flavour. Provides essential vitamins for the maintenance and development of bones and teeth. Helps the absorption of calcium and phosphorous. Adults: Chew 1 tablet per day. Store between 15ºC and 25ºC. Jamieson has been Canada’s leading manufacturer and distributor of high quality natural health products since 1922. Our products are manufactured and packaged at our state-of-the-art facilities in Windsor, Canada, and made available to Canadians and consumers worldwide. Jamieson has consistently been voted Canada’s most trusted brand of vitamins1, and for good reason: in a rapidly growing marketplace, we set ourselves apart with our industry-leading commitment to providing consumers with the purest, safest and most effective natural health solutions available. A lot has changed since 1922. In order to continue to provide consumers with the natural health solutions they need, we understand the importance of looking ahead, and leading the evolution of natural health. As a company, our shared Vision, Mission and Values are the guiding principles that ensure we continue to exceed the expectations of all stakeholders – our valued employees, our ingredient suppliers, our retail partners, and, most importantly, the Jamieson consumers who trust us to help them improve their health and wellness. Our vision is the core purpose of Jamieson, and the fundamental reason for our existence. To improve the health and wellness of Canadians. Our mission defines what we do, for whom we do it, and how we do it. To inspire and delight our consumers with health and wellness solutions that become part of their everyday lives. We combine deep consumer insights with emerging science and technology resulting in category driving innovation and growth. Our values are our guiding principles as to how we want to conduct ourselves and the behaviours we value as an organization.